MogoBlog MogoLicious Tasty Tip of the Day: These hot-spiced lattes are like a warm, cozy sweater for your belly, but not in a weird way. Great way to prepare ahead for a Halloween, Thanksgiving, or Christmas party. Add all ingredients to a 2-quart or larger slow cooker. Stir to combine. Cook on low for 2-3 hours or until heated through. Make sure it doesn’t boil! Turn slow cooker to warm setting to keep latte warm for 2 – 3 hours. You can use low to keep it warm if your slow cooker doesn’t have a warm setting, but keep an eye on it. Stir occasionally to make sure it doesn’t scald. For faster lattes, you can start on the high setting then switch to low, but I wouldn’t cook these on high for more than one hour. Stir again right before serving and taste. Add additional sugar or syrup if desired. Ladle into individual mugs. Top with whipped cream, a dusting of nutmeg, and a cinnamon stick, if desired. Serve. *Instead of 6 cups milk and 3 tablespoons instant espresso powder, you can also use 4 cups milk plus 2 cups very strong brewed coffee. 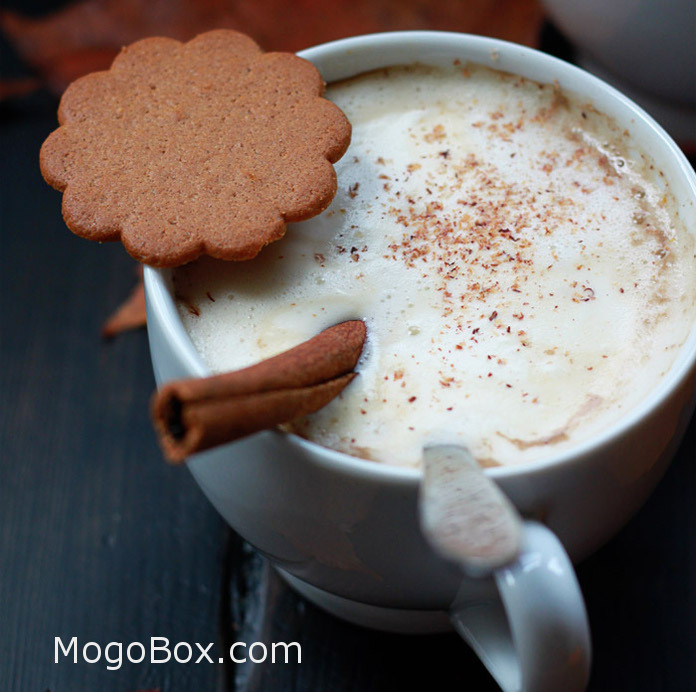 This entry was posted in MogoBlog, MogoLicious and tagged #MogoBlog, Cinnamon, Cloves, Espresso Granules, Ginger, Maple Syrup, Milk, MogoBox, MogoLicious, Molasses, Nutmeg, Pumpkin Puree, Slow Cooker, Vanilla Exract.